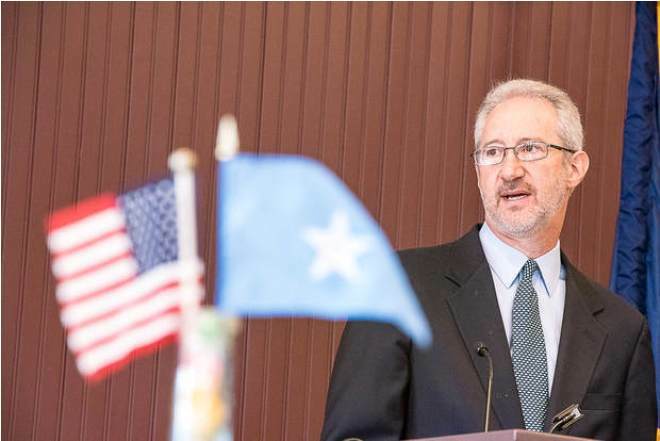 The U.S. ambassador to Somalia Stephen Schwartz has resigned, citing personal reasons, the embassy confirmed Friday. An emailed statement to VOA said the ambassador resigned September 29. It provided no further details. Schwartz was sworn in as the 13th United States ambassador to Somalia in June last year. As ambassador, he headed the U.S. mission to Somalia, which is located in the U.S. embassy in Nairobi, Kenya. Ads By GoogleThe mission maintains regular dialogue with the Federal Government of Somalia (FGS) and other key stakeholders to support the country’s efforts for peace and prosperity. Prior to his appointment, Schwartz served as the director of the Office for Australia, New Zealand and Pacific Island Affairs (ANP) in the Bureau of East Asian and Pacific Affairs (EAP). He served as deputy director of EAP/ANP from 2008-2010. As a U.S. diplomat he had extensive experience in Africa, with posts in Zambia, Mauritius, Seychelles and Comoros, South Africa, Burundi, Ethiopia, Sudan and others. He is the second U.S diplomat nominated for the post since the United States officially recognized the Somali government in Mogadishu in January 2013. In May 2015, former U.S. President Barack Obama withdrew the nomination of the first U.S. ambassador to Somalia in 24 years, Katherine Dhanani. Dhanani, a longtime diplomat with deep experience in African affairs, turned down her nomination at the time citing personal reasons. The United States abandoned its embassy in Somalia in 1991 as civil war engulfed the country and armed groups overthrew the central government.